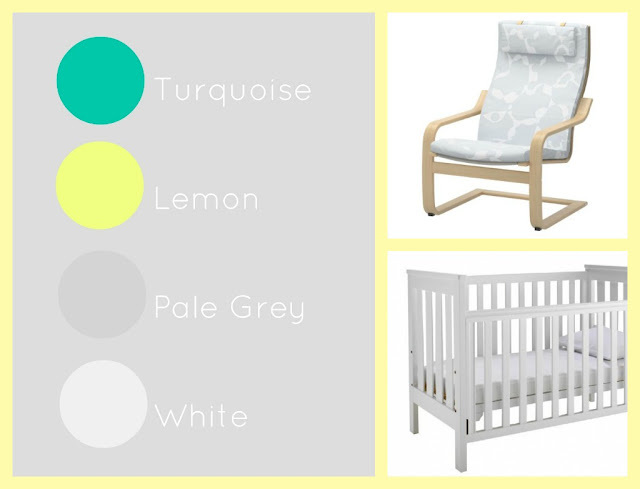 I hope you all enjoyed reading Part 1 of Project Nursery featuring my nursery colour ideas. 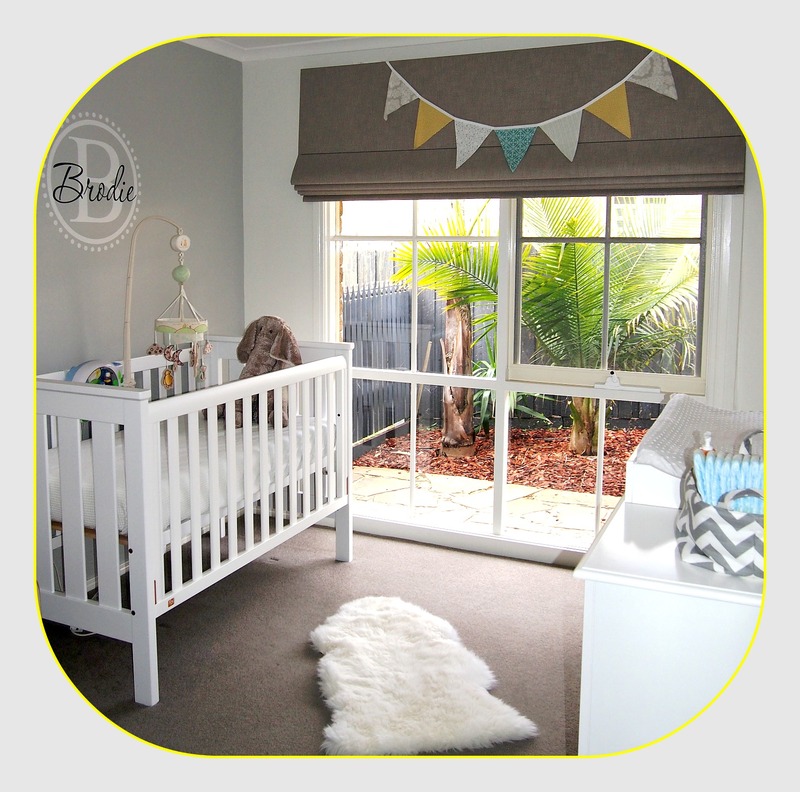 Today Part 2 gives you a little look in to Mr B's nursery and the key elements that I incorporated to create my dream nursery (on a budget!). One of the very first nursery pieces that I found to work in with my colour selection was the Poang Chair from Ikea (pictured below). If I am honest, I fell in love with the Ikea Poang chair long before I was pregnant, and when I settled on a grey and white theme for the nursery, I knew that it would work perfectly in this print. Although I would have loved a white frame on the chair, I found that the 'birch' frame still works well with the white furniture in the room. When I went to purchase the chair I went in to a complete panic as the fabric (known as 'tuna') had been discontinued only weeks early - I know, what are the chances?! I was so fortunate that I was able to track down one and it was on clearance for a bargain buy of $80 - bonus! 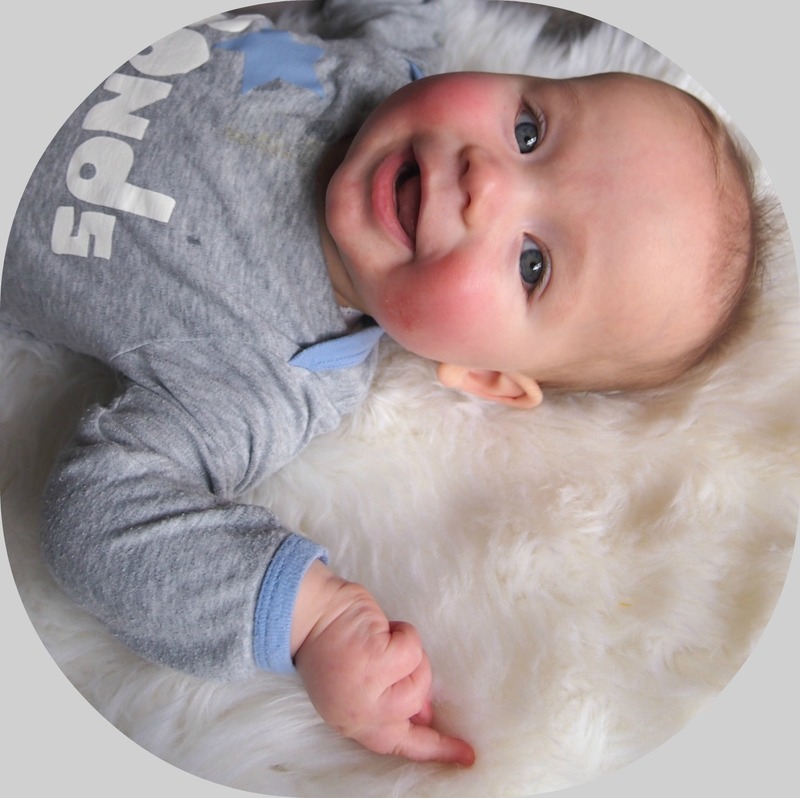 For those planning a nursery at present, I highly recommend the Poang chair for your nursery. I found that it offered terrific back support for all of those long hours spent in the chair in the early weeks. Also because I have only really used the chair for the first 6 or so months (as my little monkey quickly became too long to feed in one), I am so glad that I didn't invest in an uber expensive recliner. The Poang chair typical retails for around the $169 mark here in Australia (dependent upon fabric) and you can also get a footstool if desired. The next mission I embarked upon was trying to find a little side table to fit in the small space next to the cot and chair. I wanted a table that was compact, yet still big enough to fit a glass of water, some snacks and the monitor on (in my view, room for snacks is a must!). Oh and did I mention that I only wanted to spend less than $20 on this?! 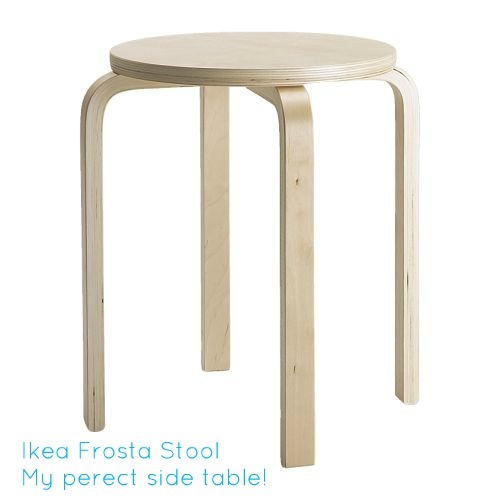 After a long time searching, I decided to use the Ikea Frosta Stool as a side table instead. It was the perfect size, shape and the perfect price ($15) and it was in the same 'birch' colour as the chair frame. The next job was finding a white cot and change table. The cot was a breeze, I settled on the King Parrot 'Scout' cot as I liked its' clean, simple lines and it converts to a toddler bed down the track. We were fortunate to receive this as a gift from the Grandparents to be, and are ever so grateful. King Parrot is the more 'economical' brand from popular cot maker, Boori. Their cots are the same fabulous quality, but on a smaller price tag. Definitely a brand worth looking in to if you are in the market for a cot. Given that space is a bit limited in the nursery (how I'd love a bigger house), I decided to source an all in one change table/chest of drawers, which was not an easy task. As usual I found exactly what I was after in the States, but nothing locally here in Australia (I swear if I lived in the States, I'd be flat broke!). Eventually I managed to track down one on ebay that was just what I had been searching for and at such a great price. Down the track the change top can be removed and used as a regular chest of drawers. The chest of drawers is so roomy, I wish that I had it in my own room for my belongings! The last part was injecting the accent colours in to the room and personalising the space. Some of this was done once Mr B arrived and some before - like I told you, I had a strong hunch a boy was on the way. 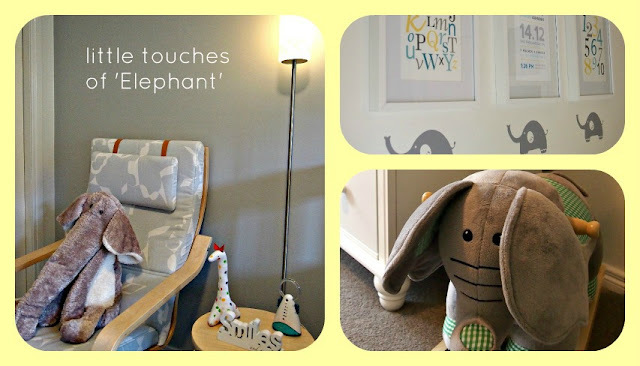 I wanted the nursery to feature an 'animal' of some kind and I decided that elephants would be super cute and fitting with the grey tones in the room. Sadly but surely, I am sure that the elephants will be phased out when we enter the toddler 'remodelling' phase and incorporate some more 'boyish' features in to the room - boo hoo!! As you can see, the room features white walls with a pale grey feature wall. My accent colours of turquoise and lemon have been injected using customised wall art, nappy caddy, bunting and framed prints. These little 'touches' were an inexpensive and easy way to incorporate these colours in to the room. Most ideas can be done yourself and cost very little for maximum results. If you are wanting to get some help in this area, then look no further than Etsy. I just love Etsy, as the sellers are just so accommodating to try and create or source products that will work within your 'vision'. You can pick up so many personalised and handmade items here for some truly terrific prices. So how does it look all together? Well it so hard to take one big room shot, but hopefully the below will give you a little idea of how it all came together. I must say that even though I am, prone to changing my mind about colours and projects, I have not tired of this room once and that is a big statement given how much time I have spent in here staring at the walls at 3am. Next up, Part 3 will focus upon storage and organisation ideas for your nursery space and look at what I have incoporated in to the little mans room. I truly hope that you love Mr B's room as much as we do. Alison, I absolutely love this room! Wonderfully done! Love it, just gorgeous Allison!!! Very cute! 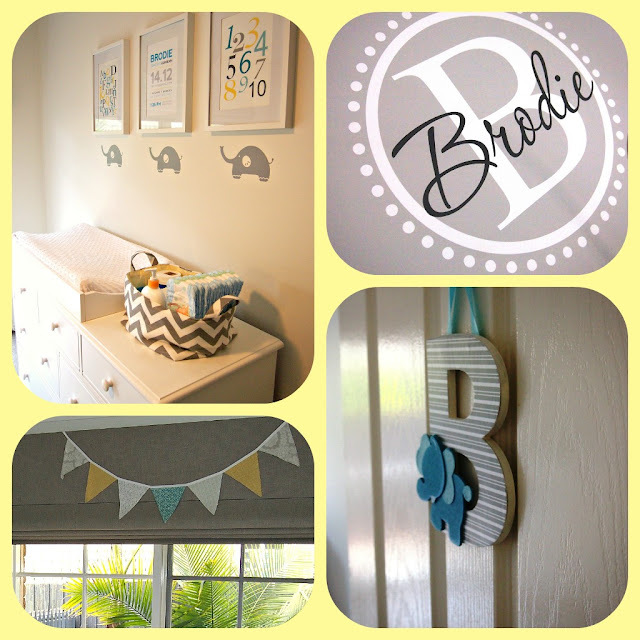 I love the colors and accessories you chose to use in the nursery! visiting from delightful order...great job on the nursery, it's very cute!